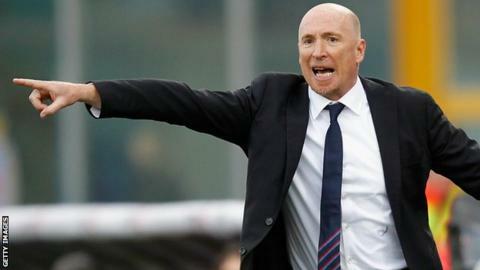 Italian side Catania have sacked coach Rolando Maran - for the second time this season. Serie A's bottom side are seven points adrift of safety with six games left. Maran, 50, led Catania to eighth place last season as the Sicilians narrowly missed out on European qualification for the first time. But he was dismissed in October after a poor start and, after being reinstated in January, was axed again following Sunday's 2-1 home defeat by Torino. "We wish to announce we have ended our collaboration with Rolando Maran, who we would like to thank for the work he has done over the season," said a Catania statement. Catania have earned only one point from their last eight matches under Maran, who returned to replace his own successor Luigi De Canio. Maran is replaced by youth-team coach Maurizio Pellegrino, who was Catania boss from 2001 to 2003.